We meet five times a year in various locations within the Philadelphia Division geographical area to make it easier for members living in those areas to attend. The meetings are held on Saturday mornings and the programs usually consist of two or three presentations related to model or prototype railroading. Additional features typically include model displays or contests, door prizes, and a 50/50 raffle. Coffee, donuts, and of course, Philly soft pretzels are always provided. In the afternoon, we typically will have open house layout tours hosted by members or local clubs. It’s a great way to meet fellow modelers, talk trains, have fun, and learn. Our meets are free to all NMRA members and we welcome guests to discover what it’s all about in hopes that they might consider joining. 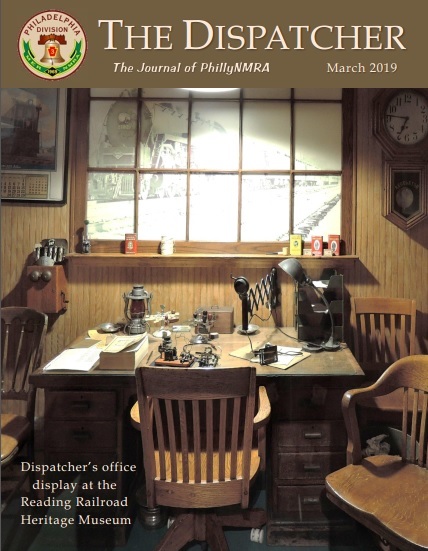 The Philadelphia Division is proud of it’s newsletter, THE DISPATCHER, published five to six times a year to keep members and other interested hobbyists informed of news and events in the area. In each issue you’ll find not only news concerning the Division, but also editorial and opinion pieces, model- and prototype-related articles, listings of upcoming events, and a description of the upcoming meet, complete with map and directions to the venue. The first eight pages are available in black-and-white printed form by subscription, but the online version is free and in full color. The additional pages contained in the online version include more articles, lots of full color photos–often previews of layouts to be open or photos of those seen at the last meet–order forms for Division sale items, membership applications and Achievement Program forms, and news and notifications regarding NMRA regional and national events. While model railroading is fun, we believe in promoting excellence in the hobby and the Achievement Program was set up by the NMRA to achieve those ends. While completely optional, this program affords modelers the opportunity to learn, advance their skills, and earn certificates for different aspects of model railroading with the ultimate goal of achieving Master Model Railroader status. Click here to read more about the program. Membership is “tripartite,” meaning that you join the NMRA nationally, and then automatically become a member at the Regional and Divisional levels. This is similar to the way many organizations are structured these days. 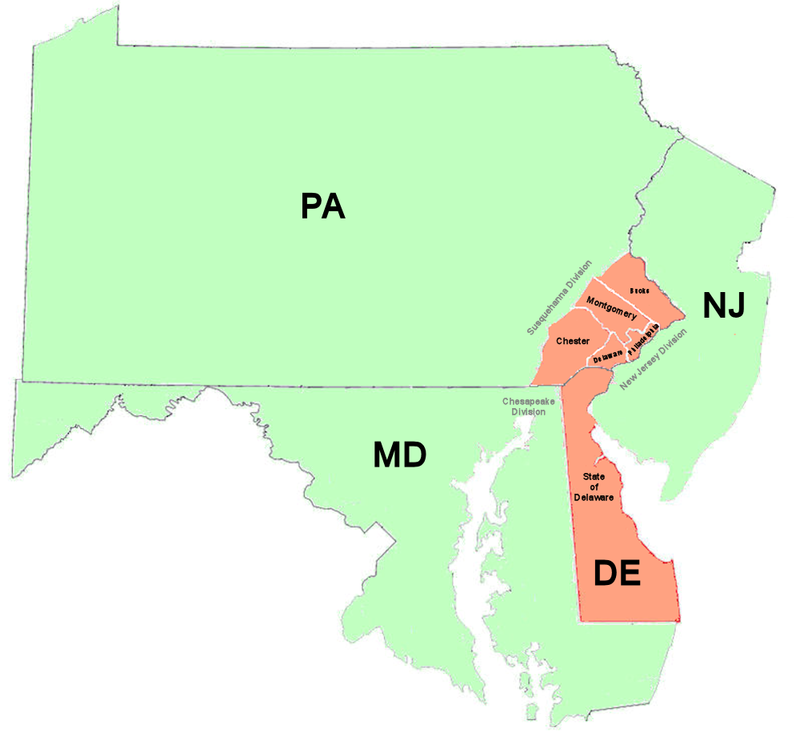 If you reside within our geographical boundaries (see below), once you join the NMRA, you will automatically be a member of both the Mid-Eastern Region (MER) and the Philadelphia Division. If you are interested in joining, click here to be taken to the NMRA’s application page. 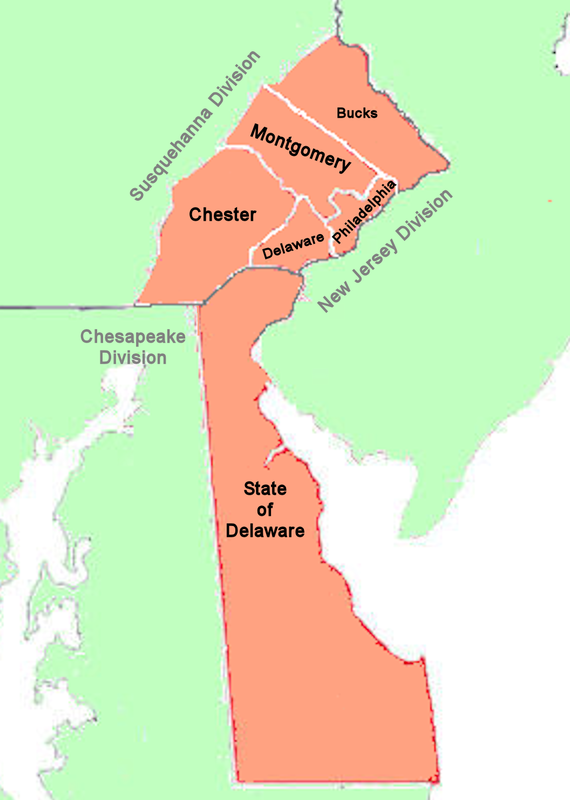 The Philadelphia Division serves Philadelphia and the surrounding southeastern Pennsylvania counties of Bucks, Chester, Delaware, and Montgomery, as well as the entire state of Delaware. Click on the map to see a close up of our area.